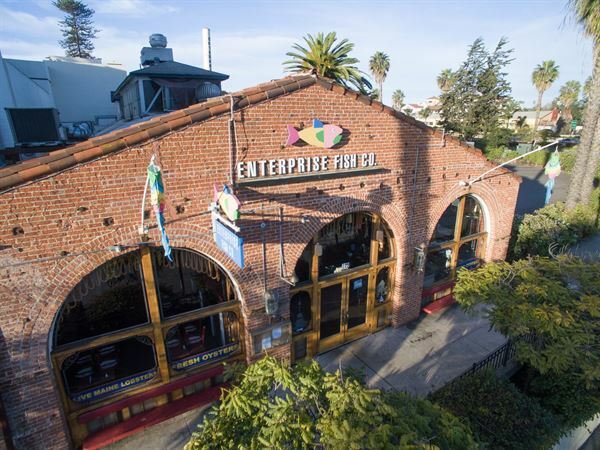 When we first opened Enterprise Fish Co. in 1979, we renovated this historic 1917 brick building to resemble any wharfside eatery one would find in any coastal town up and down the Pacific coast. Our more recent extensive renovations left the original hardwood floors, wood trussed ceilings and brick facade intact, but upgraded the decor and comfort level significantly. Photos of Venice beach and other ocean oriented sites decorate the walls. Booth and table seating is arranged around our exhibition kitchen in the middle of the restaurant. Fresh fish and other seafood is cooked over charcoal giving the dining room an excitement not found in many restaurants. As you enter the restaurant you approach our full service bar which is busy every night of the week. Just outside is our heated bar patio with soft furniture, TV's and fire table. Our secluded and fully heated dining patio seats 90 and provides a nice, quiet alternative to the bustling interior. We host private events on our beautiful patio that is nestled between foliage, with comfortable lounge seating, fire pits and candle light. We are able to accommodate a maximum of 110 people for a cocktail event, 90 people for a buffet, and 85 people for a plated dinner. A patio reservation includes your own private area, private entrance, private bar, and full use of our audio/visual equipment. Just inside we have our banquet room located at the back of our restaurant. A maximum of 50 people seat comfortably for a private event, with flexible table arrangements.